Is Faith Necessary for Rehab? It seems that every rehab center or service is faith based. Many of the community based programs are as well. 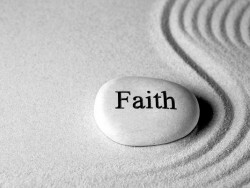 It is important to ask the question of whether faith is necessary for rehab and recovery. In order to answer this you need to understand exactly what faith provides to people and how it is integrated into rehab programs. Allows them to give over the stress and pain from life and their drug use. Faith in things has also had the added effect of calming those with mental illnesses and other issues. Faith helps people move forward and stay sober. According to the National Institute on Drug Abuse, stress, mental illness, and other emotional factors are key to who will or will not become addicted to drugs. Some entire rehab programs are based on having faith that things will get better and that you have hit the bottom of your life. Although this is not necessarily, true. This belief helps thousands of people pull themselves up with the theory that it cannot possibly get worse. Many people use faith in rehab to allow someone else to take responsibility for the things that they have done. This does not necessarily they are no longer to blame but it gives them a clear target. Rather than blaming themselves, they can blame how they were on alcohol. Many use faith as an excuse to stay away from drugs and alcohol. Some people are just do not believe in a faith based world. They have a hard time believing in something that they cannot see, touch, or put a finger on. They do not have faith so a faith based rehab will not work for them. There is no harm in not having faith in something. It is the byproduct of our society sometimes. Unfortunately, many people believe that you have to have faith in something in order to complete rehab. This is not necessarily true. When faith is confused with spirituality and religion it can cause people to shy away from rehab programs that have a basis in either. When searching for an appropriate rehab facility it is important to look for one that fits with your faith, spiritual, and religious beliefs. An atheist would not feel comfortable with a spiritual or religious rehab and a religious person would not be comfortable in an agnostic or completely nonreligious rehab. It is important to find the level of faith and religion in rehab that you are comfortable with. There are rehabs for each of the major religions and several that are nondenominational. For more information on both faith based and nonfaith based rehabs call us at 800-481-6320. Do Free Inpatient Drug Rehab Centers Really Exist? Free inpatient drug rehab centers do exist. As they are necessary to many people who do not have the money to enter expensive rehab centers, free inpatient centers are an important resource for recovery. Why Choose Inpatient Drug Rehab? Inpatient drug rehab is often essential for many patients’ recoveries. While outpatient centers provide most of the same…. Nearly all of the states in the country now have or are in the process of implementing Prescription Drug Monitoring Programs (PDMP), which are electronic data-sharing systems designed to reduce the current escalation of the abuse and addiction to pharmaceuticals. As more of the nation continues to update into the digital age, so has the…. Group and Individual Counseling – What’s the Difference? You may be wondering what you can expect if you enlist in counseling at drug rehab centers. What really happens in those therapy sessions and how come some of them are one on one individual sessions with a counselor while others are given in a group format? If you are unsure about the way that…. Many insurers cover drug treatment to some extent whether it’s comprehensive coverage that will pay for the entire cost of a drug rehab center or your insurer only covers certain aspects of treatment it’s important to understand what you options are for drug rehab insurance before you enter into a treatment program. Some questions you…. Cocaine addiction is associated with various detrimental health effects that are both physical and psychological. Various cocaine related psychological disorders have been documented and are currently treated in many rehab centers today. To date, there are ten common classifications of psychological disorders related to cocaine addiction. Here’s a look at the most common types of…. Addiction is hard enough to beat, but when you believe the myths surrounding it, it’s even harder. Here are five addiction myths that hold you back and the truth that can set you free. Myth 1: You Can Control It No matter how much you try, you can’t control your addiction. The old adage, “One…. Once you’ve decided to get help, you’ve chosen an inpatient drug rehab center for your treatment needs and you’ve decided on a date to be admitted to the program you’ll have to start packing your bags for your extended stay in treatment. What do you bring? Some things are not acceptable in inpatient drug rehab…. “Your past will come back to haunt you,” it’s a phrase that so many addicts remember and equally regret having ever heard and yet as sobriety looms near so too do memories of the past. Drug addiction creates a chaotic atmosphere that is plagued by arrests, fighting with friends, family and loved ones, and hundreds…. Heroin is an opioid that they make from the opiate morphine. It is a synthetic form of the pain killer that originally came from the opium poppy in Asia. Heroin is typically a white or brown powder or in the case of Black Tar Heroin, it is a black sticky substance resembling tar. According to….